Vanguard should probably be thanking Warren Buffett. In Berkshire Hathaway’s (NYSE:BRK.B) 2014 shareholders letter, Buffett mentioned Vanguard funds in a big way. Specifically, he recommended that the cash left to his wife be invested 10% in short-term government bonds and 90% in a very low-cost S&P 500 index fund. Not just any index fund mind you, but a Vanguard fund in particular. Whether it be exchange-traded funds (ETFs) or mutual funds, the Oracle of Omaha believes Vanguard funds are the way to go. With that in mind, I’ve put together a portfolio of two ETFs, two mutual funds and a fifth wildcard. The resulting portfolio should be appropriate for Buffett’s wife — or anyone else, for that matter. The goal here is to keep costs to a minimum while generally sticking to Buffett’s hypothesis when it comes to his wife’s investments. In that case, it makes more sense for the S&P 500 investment to be a mutual fund rather than an ETF (although Vanguard Funds do offer commission-free ETFs) to avoid paying commissions on the largest segment of the portfolio. The Vanguard 500 Index Fund Admiral Shares (VFIAX) charge an annual expense ratio of just 0.05%. Your fees would amount to a mere $25 on a $50,000 portfolio. That’s hard to beat, and Buffett knows it. The largest holdings in this fund include Apple (NASDAQ:AAPL), Exxon Mobil (NYSE:XOM) and Google (NASDAQ:GOOGL, NASDAQ:GOOG). The minimum investment is $10,000. EDITOR’S NOTE: Corrects to $25 in annual expenses. The VFIAX covers off the large-cap portion of the portfolio quite nicely. While Buffett might not be fond of mid-cap stocks being added to the mix, evidence suggests mid-caps outperformed large-cap stocks over a four-year period between 2009 and 2013. In fact, John Hancock published a report in 2012 that cautions investors about underweighting mid-caps because of an assumption that a large-cap fund combined with a small-cap fund will do the job. That’s simply not the case. Mid-cap stocks tend to provide an attractive combination of risk and reward. For this reason, I recommend the Vanguard Mid-Cap Index Fund Admiral Shares (VIMAX), which tracks the CRSP Mid Cap Index, an index composed of stocks that fall between the top 70%-85% of investable market capitalization. The average company in the index has a market cap of $8.2 billion. They’re big enough to survive an economic hit but small enough to still be growing. With an expense ratio of 0.1%, this entry on our list of Vanguard funds is giving you safety and performance in one. Top holdings include Forest Laboratories (FRX) and Illumina (ILMN). Although I just said mid-caps are a key part of any portfolio and tend to outperform small caps while utilizing less risk, there is always a place for small caps in your portfolio. That’s especially true when the two previous picks from Vanguard Funds are almost 100% invested in the U.S. with virtually no international exposure. That’s just not smart when you consider how strong European stocks have been since last August. For this reason, a little bit of love outside America makes total sense. My recommendation is to go with the Vanguard FTSE All-World ex-US Small-Cap ETF (VSS), a fund that tracks the performance of the FTSE Global Small Cap ex US Index, which consists of approximately 3,050 stocks in 46 countries including the United Kingdom, Canada, Japan and Taiwan. Investing in both developed and emerging markets, the fund gives you good exposure to some of the world’s future stars at an annual expense ratio of just 0.2%. With such low fees, it’s no wonder Vanguard Funds has $2.2 billion invested in this ETF. Buffett recommends that 10% of his wife’s portfolio go to short-term government bonds. 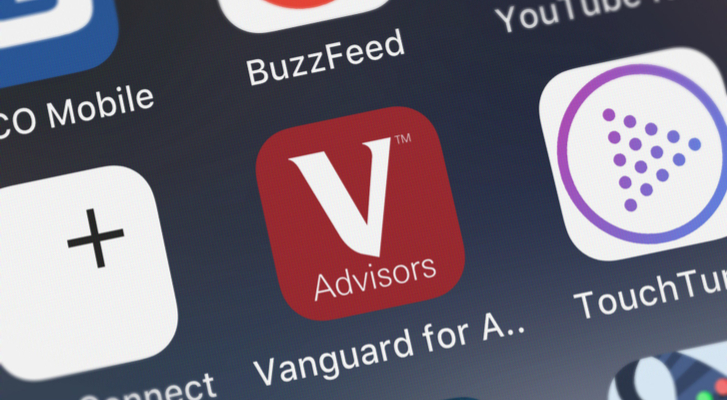 Vanguard Funds has an ETF that does exactly that. The Vanguard Short-Term Government Bond ETF (VGSH) invests in investment-grade U.S. government bonds with average maturities between one and three years. The risk, on a scale of one to five, is one — meaning this Vanguard ETF is for conservative investors looking for stable share prices. And with an expense ratio of 0.12%, this ETF should give you peace of mind for your short-term needs. On this final piece of the puzzle, I’m going defensive. The mutual fund version of the S&P 500 has less than 10% invested in consumer staples’ stocks. I mean to remedy that by putting the final 10% in the Vanguard Consumer Staples ETF (VDC), a collection of 109 household names including Procter & Gamble (NYSE:PG) and Coca-Cola (NYSE:KO). Since its inception in 2004, VDC has had but one year of negative annual total returns, and that was in 2008 when it experienced a 17% decline — 20 percentage points better than the S&P 500. When the you-know-what hits the fan, you’ll be glad you own this particular low-cost ETF (with a 0.10% expense ratio) from Vanguard Funds. It seems the “keep it simple” rule holds true, and Warren Buffett is the No. 1 follower. Article printed from InvestorPlace Media, https://investorplace.com/2019/01/5-vanguard-funds-warren-buffett/.